An annual Re-Post. We cannot remember them all; but each year we can remember one. “For God’s sake child! Flee Minsk before it’s too late!” the wounded Red Army Major she tended urged her. “Be still!” Anya said. “I’m taking your picture.” . She was an avid Communist, a member of Young Pioneers and a student member of Komonsol, the All Union Leninist Young Communist League. On June 22, 1941 the Wehrmacht invaded the Soviet Union, and in six days they were in Minsk. The girl now called Anya lost her dream at 17 years old. Within days of the arrival of the Germans the knock had come at the door. “Raus Jews! 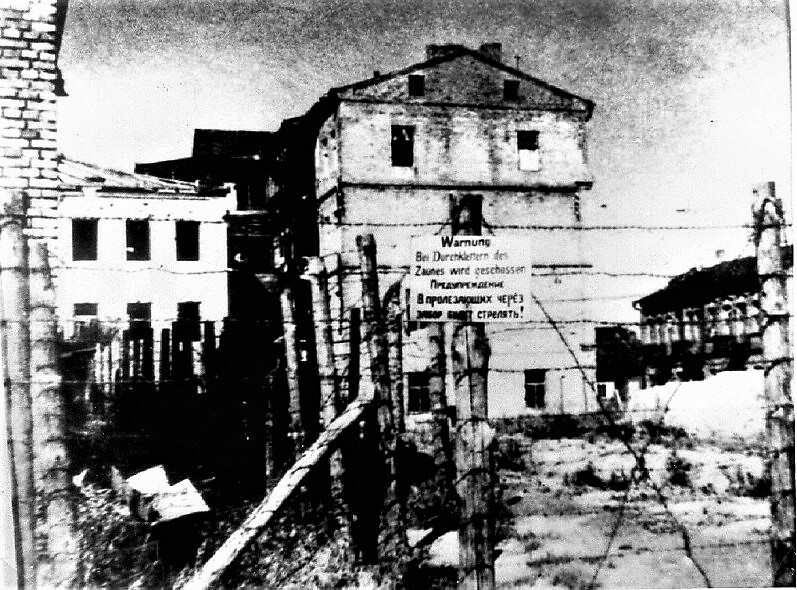 You are moving!” She and her parents along with 100,000 Minsk Jews were marched to a ghetto and walled inside. Anya didn’t want to leave but took her mother’s advice and found a way to the outside, lightened her hair to a safe, Teutonic dark blond, bought some forged identity papers and took her new Russian name. She was no longer Mariya (Mascha) Borisovna Bruskina; she was now the Russian girl Anya. Anya immediately joined the resistance. She was asked to volunteer at the Polytechnic Institute Hospital (which had been set up for wounded Red Army prisoners) as a nurse and, being young and pretty, she was able to come and go without much attention other than the leers of German guards. She smiled on cue as if she spoke no German and did not have to worry about engaging in any extensive conversations. She was glad she didn’t understand all the comments passed back and forth when she walked by. In the hospital Anya found that some 15 wounded Red Army prisoners were being held. She spoke with her comrades in the resistance and a plan was hatched to free the Russian soldiers so they could join the resistance. In order to make an escape they would need civilian clothes, money and identity papers. Anya volunteered to smuggle in clothes and money as well as a camera to take pictures of the individual soldiers in order to forge I.D.s. Over a period of weeks, she carried everything that was necessary and during the night shifts was able to take the required pictures. The escape went perfectly. Within hours the Germans were hunting for the prisoners. It didn’t take long to find them. Within two days they were all rounded up and shot…..except for one who lived a bit longer when he betrayed those who had helped free him. In the end, the Germans shot him as well; a traitor twice-over, in their minds. Anya was arrested by Lithuanian collaborators and turned over to the Gestapo along with Kiril Trus (a World War I veteran) and a 16 year old boy named Volodia Shcherbatsevich. They were brutally beaten and tortured for information but none talked. Anya knew she was going to die (she had quipped to her fellow prisoners that at least “I don’t have to worry about dying of starvation.”). She was very worried about her parents in the ghetto instead and passed a message to the resistance asking if they would deliver a letter to her mother. Before being executed, Anya, along with Kyril and 16 year old Volodia, were paraded through the streets of Minsk by Lithuanian Nazi collaborators. 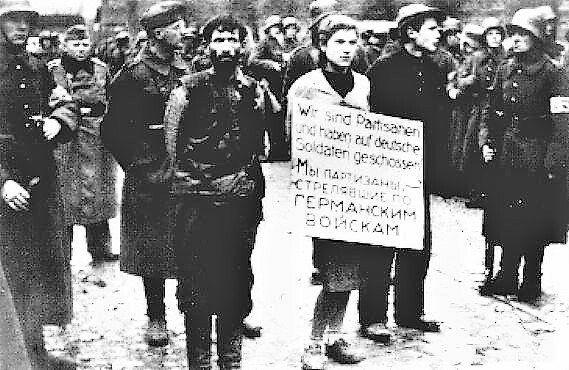 Anya, who was Mariya once again, wore a placard around her neck in both German and Russian – “We are partisans and have shot at German troops” – though she had not. 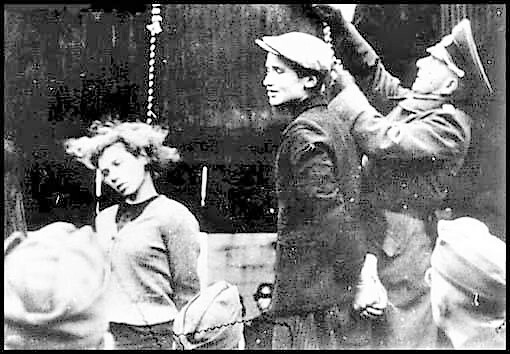 She and her fellow comrades were hanged one at a time in public on Sunday, October 26, 1941 in front of the yeast brewery and distillery plant Minsk Kristall. She was the first to die. There was no gallows to drop her and end her suffering quickly. She was simply stood on a stool, the rope around her neck, hands bound behind her, but not her feet. The Germans stood her up facing the audience. They wanted all those watching to see her die. She turned around. The Germans faced her forward. She turned around again. She would not face forward. 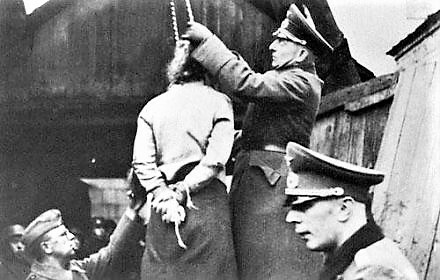 The Germans let the bodies hang for three full days before allowing them to be cut down. Volodia’s mother was hanged as well from the crossbar of the gates outside of the Minsk Academy of Science. While ritually washing her body before burial, the hair dye washed away revealing the dark haired girl beneath. Anya’s mother lost her sanity and died in the Holocaust. Her father escaped the ghetto, joined the Red Army and survived the war – but he died a lonely and broken man, unable to honor his daughter. Although the pictures of her death, taken by the Lithuanians, were well publicized after the war, Soviet and later Belarus officials claimed not to know the identity of the pretty young girl. On a memorial plaque at the MinskKristall where they died she was listed as “unknown girl”. It was always suspected that the authorities knew full well who she was; they knew the names of the two men. But Mariya Borisovna Bruskina was a Jew – and the authorities may have had difficulty in admitting that a Jewish girl was a resistance hero. Maybe it was just bureaucratic incompetence. Finally, on July 1, 2009 the Municipality of Minsk replaced the memorial plaque, removing “unknown girl” and inserting her name “M. B. Bruskina”. Her father did not live to see it. Do you have a teen-age daughter? Does she have dreams? Look at her picture and see her in your dreams. I remember this well from previous years, Frank. Never any less affecting and moving. Just one of countless tragedies of Man gone mad.